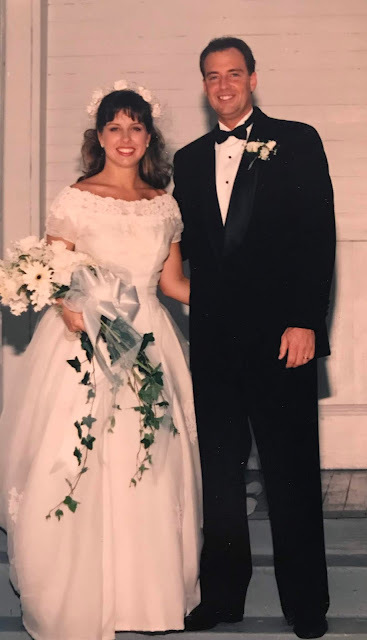 June 5, 1993 we were married on a hot humid day in Madisonville, LA, in a little old wooden church with our best friends and family. I wore my mother's wedding dress and you wore a rented tux. The next day we left for two weeks in Greece and the beautiful islands of Mykonos and Santorini. We moved to Georgia where we have lived in 3 homes, had 3 beautiful babies and made countless memories. We have faced illness, injuries, surgeries and hospital stays. We've traveled across the country and around the world and always come home to Georgia. We've kissed atop the Eiffel tower, we've swam in waterfalls, we've snow skied in Dubai, we've flown in a helicopter over Kauai. We've walked beaches in the Caribbean, the Mediterranean and the Pacific. We've explored caves and rain forests and now we can even say we've been to the grand canyon! May the next 25 years be filled with many more adventures, laughter and love! Happy anniversary - and wishes for many more!! Happy Anniversary. May you continue to make wonderful memories. Beautiful Dress - Happy Silver Anniversary! Congratulations and what a beautiful picture! Happy Anniversary. May you enjoy the next 25 as much as the first. It sounds like you've had a beautiful, love-filled 25 years with your soulmate, Diane! Wishes for another 50 years or more together! Congratulations! Hope you have many more healthy, happy years together! Happy Anniversary and such a lovely pictures!